Using those numbers to calculate percentages, these are the recipes I used based on a 1% stock solution. As you can see, I experimented a little with different fuchsias and blacks. Nowhere near the target color. In fact, these samples are actually closer to the prediction I got from the Dye Mixer Applet. In comparing my four samples, the color differences are subtle, in fact barely discernible on my computer monitor. Most notably, the fuchsia 5B samples (1 & 3) appear a little cooler than the fuchsia 8Bs (2 & 4). Not much difference between the blacks however. I also note that I didn't stir well enough, as the color is spotty. About the only thing I am satisfied with is the depth of strength (DOS). Comparing them to the target color, they are obviously purple. Too purple, which means the fuchsia was too strong. These experiments affirm what I wondered about, and what many of you confirmed in the comments; that equal weights of various Procion MX colors are not equal in dyeing strength. So it would seem that the next logical step would be to experiment with the proportions. It would be wonderful if I could come up with some concrete numbers for these differences, but that remains to be seen. You need scales! Three or four years ago Charleen recommended 200-z My Weigh scales. Here is one site though I'm sure if you search you'll find them cheaper than sold here. I think I paid around $30. Right now I'm using a scale which weighs hundredth grams. I looked at some jewelers scales that weighted to a thousandth of a gram, but thought that was over kill for the moment. At the moment though, I'm only weighing out one gram of dye powder per color for my 1% stock solutions. On thing I've learned is that fuchsia is a highly reflective color, so this is why it tends to dominate. My next step will be to experiment with different percentages of fuchsia. Something I hop to get a start on next week. I've been reading your posts on this colour mixing exercise and feeling rather puzzled. I don't understand why you have set yourself such a difficult challenge as I don't see how you can achieve what you are trying to do by the method you are using. I'm sure you already know that colours made by mixing light (as on computer screen) works differently from colours we perceive from reflected light (as on dyed yarns)? Second thoughts on re-reading your earlier posts, I think maybe you don't? And I expect you know a bit about colour callibration of computer monitors and how they all show colour differently (even setting to 6500k as the Dye Mixer web site suggests produces erratic results, you need callibration software as used by graphics professionals, very expensive last time I looked). I am not surprised that the Dye Mixer Applet came up with reasonably good predictions, as the website says it uses reference data collected with a spectrophotometer and is input spectra from several reference sources. This looks to me like a sound scientific basis for analysis. I hope you are not as puzzled by my comment as I am by your posts, as I know why you want to be able to translate screen colours into dye colours. How about approaching it the other way - dye the yarn, and match it to a colour on the computer? You could start with 100% one colour, then 50/50 mixes and see whether you are getting a halfway shade or whether it is biased more to one colour than the other. I'm not laughing, I'm not laughing, I will not laugh.........!!!!! If it were me, I would be crying, for awhile at least. Oh, Leigh, I'm so glad you did this. Now whenever some newbie (and they ask more frequently than you might think) asks about this, all we need to do is link to this page. I am so sorry! You worked so hard! But you have performed an absolutely invaluable service. And you have also won the very hard way some good information about how the different colors interact. Apart from spotting a couple of typos as soon as the last comment was posted :( I also thought to add that with light you can use pure colour whereas with dyes you have chemistry to consider - the reactions between the dyes and their individual chemistry means they just don't mix like light adn don't always behave in predictable ways? I did a lot of experiments mixing watercolours a few years ago and the results of different yellow/red/blue paints in combination taught me a great deal. Some mixes were not at all what you'd expect. Maybe you already know all this and I should just go off and lurk again? The book, "Creating Color: A Dyer's Handbook" explains how dyes differ in molecue size etc. She divides them into "classes" of dye, based on the weight of a tsp of dye. Read her book and you will save a lot of money, time and frustration. Good luck! Dorothy, if I had known what I was getting myself into then I probably wouldn't have challenged myself at all, :) It's just something I've been wondering about every since the OLG did the computer design workshop. Unfortunately, I do have a way of just jumping into something, just to see what I can do with it. Actually I'm not trying to match colors on the computer monitor, rather, I'm trying to match color's picked up from photographs, using the computer as a tool to do so. I haven't really been focusing on the way the monitor creates color, but rather the way the printer creates color. Hence the use of the CMY primaries plus black. The final test is how well the color matches the photo. Of course printer inks are not dyes, and so they aren't going to behave the same way. The real challenge to myself is learning how the pmx dye colors interact with each other so that I can use photos for color schemes in my weaving. I'm not sure what you mean by dyeing the yarn to match the monitor, since the fuchsia has a strong effect on the outcome, my plan is to work through a series of samples, decreasing the percentage of fuchsia to see what happens. I think this is what you are saying too(? ), and that I just used a different starting point that you would. Thank you Peg, but I'm not done experimenting yet! If anything, it has challenged me to continue working on this problem. I don't have the scientific and mathematic background that Dorothy has, so I expect a lot of error in my trial and error. Anonymous, thank you so much for the book recommendation. I checked it out on amazon, and it sounds like what I need. I ordered one and look forward to reading it. Leigh, I don't have a scientific / technical background! I dropped science at school age 16. My subjects thereafter have been English & French languages and literature, art and English law. If I'd carried on with science I might be able to explain better! I just have an enquiring mind and take every opportunity that comes my way to read stuff and to talk about how things work with scientists and engineers. The basic physics I did learn at school taught me that colours are either produced by transmitted light or by light being absorbed. The "cyan" on the computer screen is transmitted and a combination of blue/green, BUT the "cyan" on a fabric is seen as a result of red light being absorbed by the fabric leaving blue / green. You can't relate CMYK to dyes because they just do not relate. CMYK is an approximate (not exact) system for mixing printer inks and the inks are designed to behave in predictable ways together. The procion dyes are not designed to behave in the same predictable ways. I found that on the Dye Mix Applet web site says most everything I want to say under "Technical details". As a non-scientist I have my Larousse Dictionary of Science and Technology at my side to help me read and understand this sort of writing! To achieve what you are trying to do, most of the work is done by this applet. It tells you what happens when you mix the Procion Dyes. All that isn't done for you is linking that back to RGB, but the technical details say sRGB is used to display the colours so you can sample the colour displayed in GIMP to read what the RGB is. 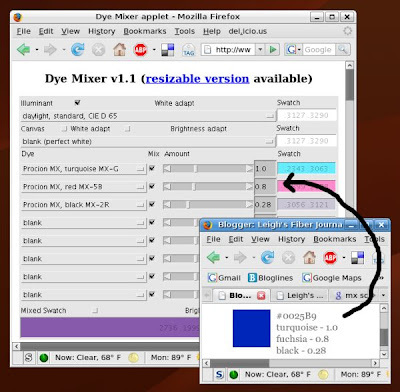 The author of the applet has done lots of sampling of the colours made by mixing Procion dyes and using technology that converts the reflected colour from the procion dye in to spectrum (transmitted light) colours to show in this applet, so this applet is a superb tool. I was impressed by the list of reference sources used in conjunction with the results form the spectrophotometer. Now I'm off to find out more about that book "Creating Color: A Dyer's Handbook", it sounds like another useful reference book for my library. Well, if that's the case then it's all over my head! But it does make me all the more curious as to how the rest of my experiments will turn out. Great start to the experiment! Now you have a good baseline to move upward and/or downward from. One of the things I have always enjoyed about you since we both first started blogging, is your intrepidity when it comes to experimenting. This is another great illustration of that. I've seen you over the past few years, work on several projects and I'm always impressed by your systematic approach. I'll be interested in seeing how your batch with percentages goes. Science is all about asking questions, not necessarily about getting answers the first time. Yes, CMYK is different from RBG (and you get that) -- however, my understanding is that you are working on coming up with a method of using the CMYK processes (sampling color from photos) and eventually translating that into an RGB process for dyeing. I'm cheering you on! I wouldn't have expected a match the first run through. Also, (I haven't looked) but are you sure that the colors you are using of Procion are what they (the maker) considers their own colors for "primaries"? I'm sure you probably have checked that out already. I know that your aim is probably totally different to mine - but I would agree with Dorothy and would probably just take the time to create a "colour pyramid" for a range of colours. i.e. 100 percent of colour A, 95 % of colour A plus 5 % colour B etc. this way I could look at my sample (though I'd have to do one card for wool, one for silk etc...) card and choose the right proportions for the colour I want to achieve. I find your experiments interesting to read - but I would not want to put so much time and effort into something that does not seem to work all that well:)) I guess I am more a practical crafter than a "theoretical" scientist! Thank you for the encouragement Jane. As you say, I really didn't expect a match with the first samples. I had the same question about the Procion MX primaries, and after scouring the archives of DyersLIST chose the turquoise for the cyan and fuchsia for the magenta. The experienced dyers on that list agreed that these plus yellow made up the second set of primaries. I've also found a website that has done some interesting things with just the printers primaries; more on that soon. Bettina, I understand what you are saying, but am not sure that I could choose which colors and what amounts to mix by using proportion samples only. I could do that with paints, but I'm finding that dyes don't react the same colorwise. Which is part of the reason I wanted to do this experiment the way I did; with a recipe of sorts to start. Obviously the next step for the dark blue I am aiming for will be to work with the proportions. With my baseline color (no matter how correct or incorrect) I will have something for comparison. Boy or boy, do you set a bar high, or what? I am so not scientific. Actually, I'm not scientific at all. Mim and I took a dye class from Charlene Schurch years ago and I still have my color card samples. So many who took the class decided to do the "practical" thing and used their results in projects. Anyway, when Mim and I get together to dye, we bring photos and pictures, sometimes greeting cards, and then we eyeball the results we got from the workshop and try to imitate them. We use veterinary syringes and calculate by parts - three parts warm blue, two parts warm red and one part cool yellow. I'm never disappointed, though often surprised. BTW, your results are gorgeous. I lean toward the EZ school - for predictable yarns, buy 'em. Wow, I've tried duplicating recipes for dye hues, but never thought of trying this out. Thanks for beating down the path! I wonder how many real samples were used to create Dye Mixer, or if it's more a theoretical thing; especially since colour charts are based on interaction of light through transparent colour while when using dyes, there must be some interaction between the densities and physical properties of the ingredients. BTW: I got here through links to your links page -- Thank You for a wonderful resource! Sharon, I hope eventually to be able to do the eyeball method! 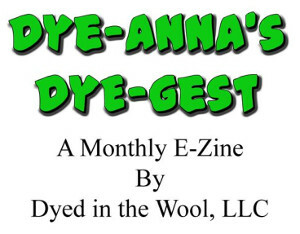 It would be much easier than my approach, but I'm just not familiar enough with the dyes yet. SpinningLizzy, thank you for visiting and taking the time to leave a comment. My 2nd set of samples are going much better and I'm really excited about the results, not to mention that I'm really learning a lot. I've wondered about the Dye Applet too. It says the blends are developed from dye spectra, using a spectrophotometer and dilutions of the dyes, but then it gets over my head!